Posted on August 6, 2011 February 23, 2017 by Ian C.
We are part way through some re-construction of our now 10 year old addition, with the goal to put a fireplace in to enjoy real log flames in the winter! 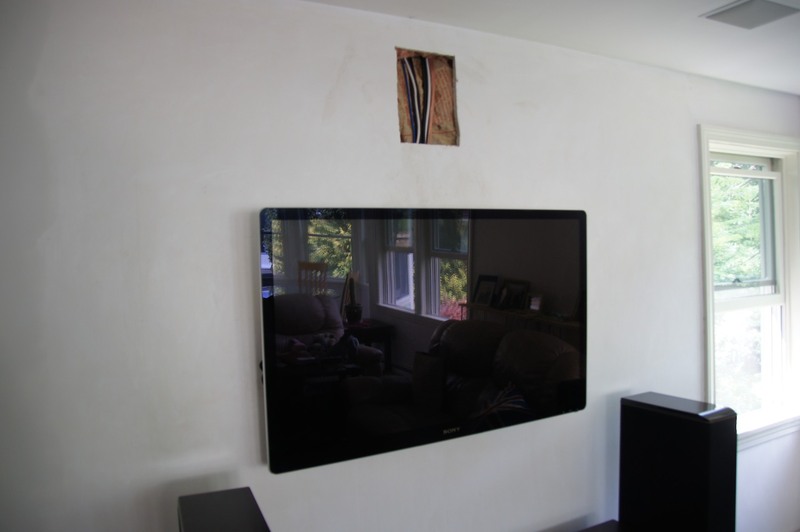 We began by having an outside window removed and filled, giving a new wall to move the TV to, and then the old TV wall became free to frame a fireplace and hearth! You can see here the framed fireplace / hearth, and new TV location. The two seat sofa and chair in the foreground will eventually be replaced by a larger three seat sofa. The last picture also shows the missing window – or doesn’t – between the new air compressor piping, and the gutter. Thumbs Up… It’ll keep me warm when Kittie kicks me out.